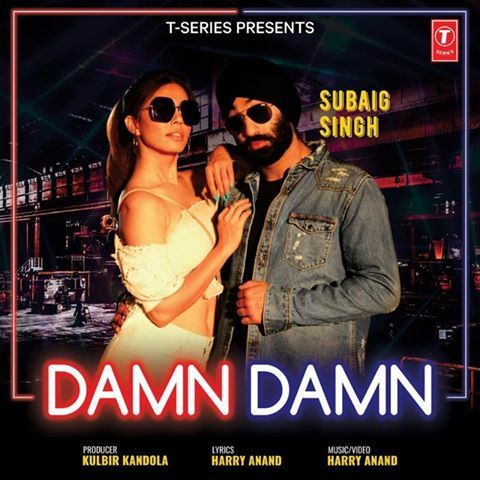 The British Asian singer, Subaig Singh, joins hands with award-winning Bollywood producer Harry Anand for his new song titled “Damn Damn”, releasing worldwide, on 4th April 2019 under the banner of T Series. Subaig Singh’s fans will love the passion that has gone into the creation of this track and we can’t wait for everyone to hear it. Subaig said, “I am really excited to be working alongside someone as accomplished and creative as Harry Anand and I feel very blessed to have been given this opportunity to take my career to the next level’’. Talking about the collaboration, Harry Anand said: “Working with Subaig has been such an effortless and enjoyable journey. I am always trying to find new ways of collaborating with like-minded international artists that share a similar passion for their music and I found a perfect fit with Subaig. The track is very powerful and the video is a grand, cinematic Bollywood production. Subaig’s strong Punjabi vocals, sung over a modern, urban trap sound are sure to be a big hit in the nightclubs of Mumbai and Delhi. Written and directed by Harry Anand and produced by Kulbir Kandola, this international level production seeps into every nook and cranny of the listeners’ senses, not just pleasing to the ear but blowing their minds with a dazzling visual performance. The video has been shot in Limelight Studios in Mumbai, one of Bollywood’s best-known film locations. The year 2018 featured a burst of activity from Subaig Singh, with a series of well-coordinated events and the release of this track will also coincide with some headline-grabbing events such as the Sandwell & Birmingham Zee Mela 2019.